ONE PAN Roasted Lemon Garlic Butter Shrimp and Asparagus tossed with chili flakes and fresh parsley is not only bursting with flavor but on your table in 15 MINUTES! No joke! I think it’s time for a ONE pan meal, yes? 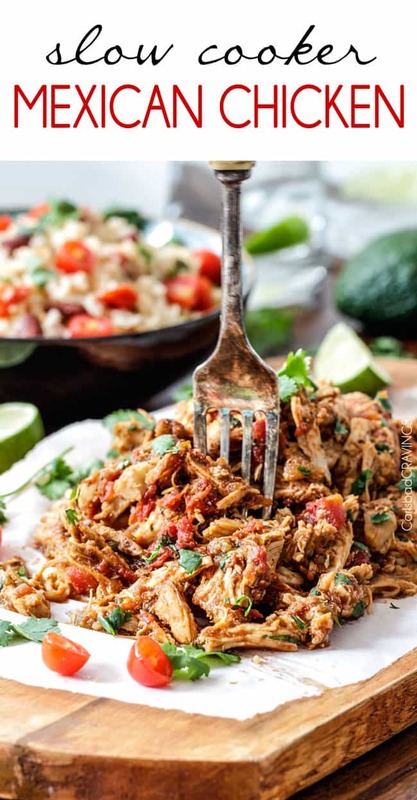 What about a one pan sheet pan meal in 15 minutes? 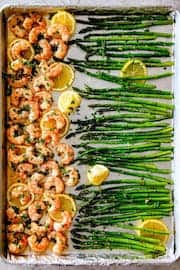 What about a One Pan Sheet Pan 15 Minute Meal with juicy, plump shrimp and crisp tender asparagus? 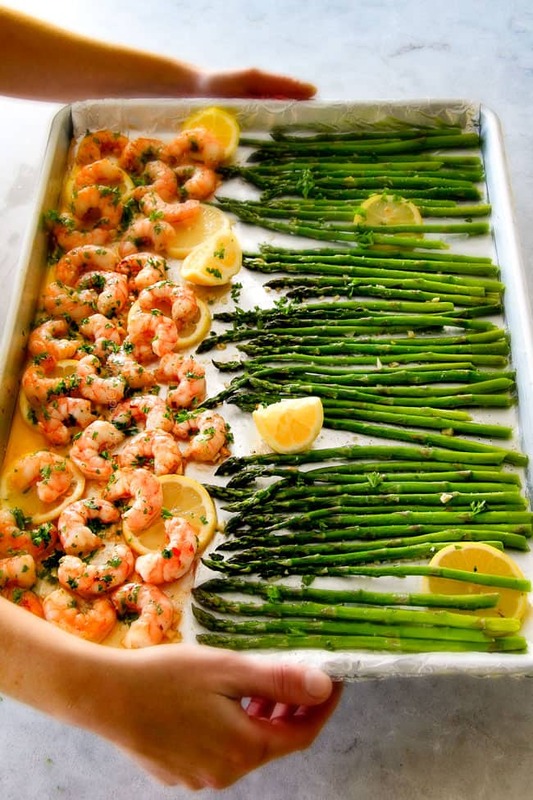 What about One Pan Sheet Pan 15 Minute Lemon Garlic Butter Shrimp and Asparagus? 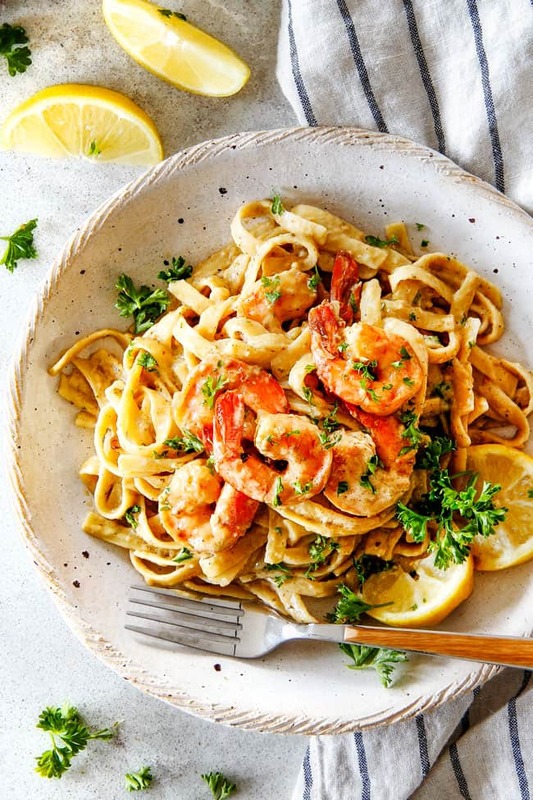 One of the simplest yet, yet most satisfying meals has to be shrimp. Its one of those quick and easy walk-in-the-door-last-minute-meals that you can make at any time with frozen shrimp. And one of the simplest yet most satisfying flavor combinations to pair with shrimp has to be the dynamic trio of lemon, garlic and butter. 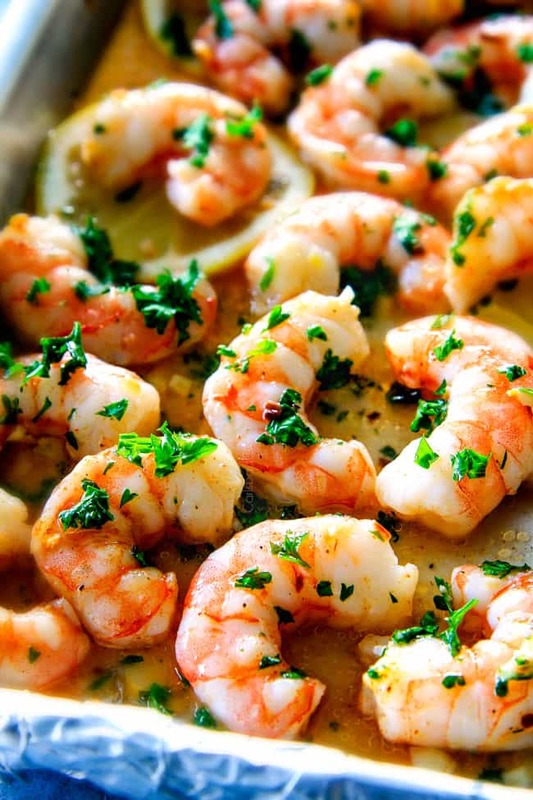 Shrimp looooves a good lemon garlic butter bath. 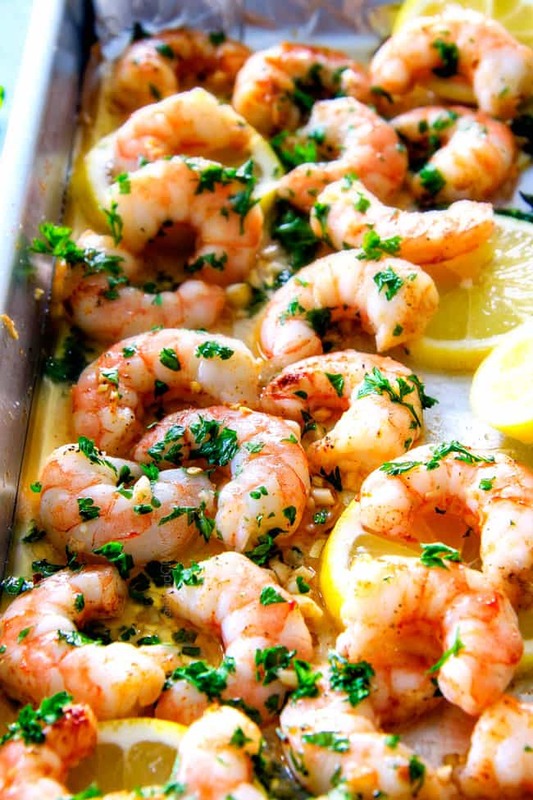 But instead of creating a sautéed lemon garlic shrimp recipe, we are going to roast our Lemon Garlic Butter Shrimp! Have you ever roasted shrimp? It is one of my favorite methods to produce perfectly even cooked shrimp and the hands-off method is foolproof and ridiculously easy. 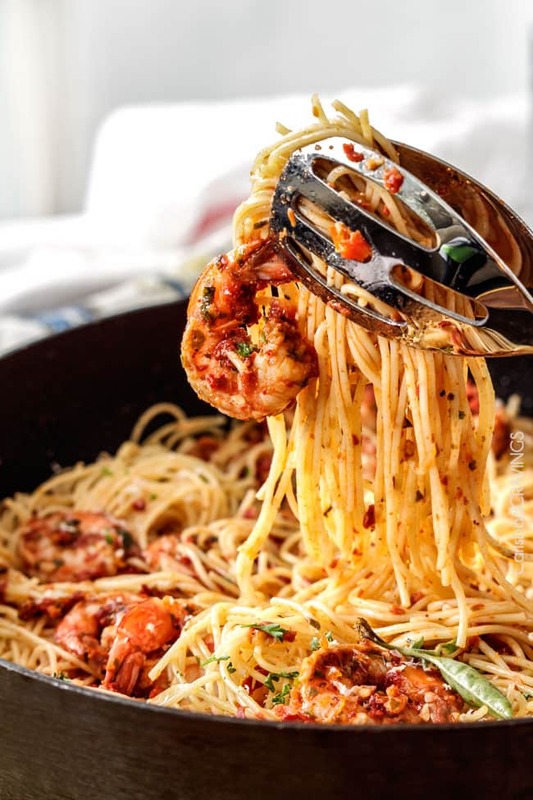 More importantly, the spice infused oil has longer to permeate the shrimp (6-8 minutes) so as they transform into tender, fragrant, succulent morsels, they drink up the flavor and emerge hot, juicy and exploding with deliciousness. 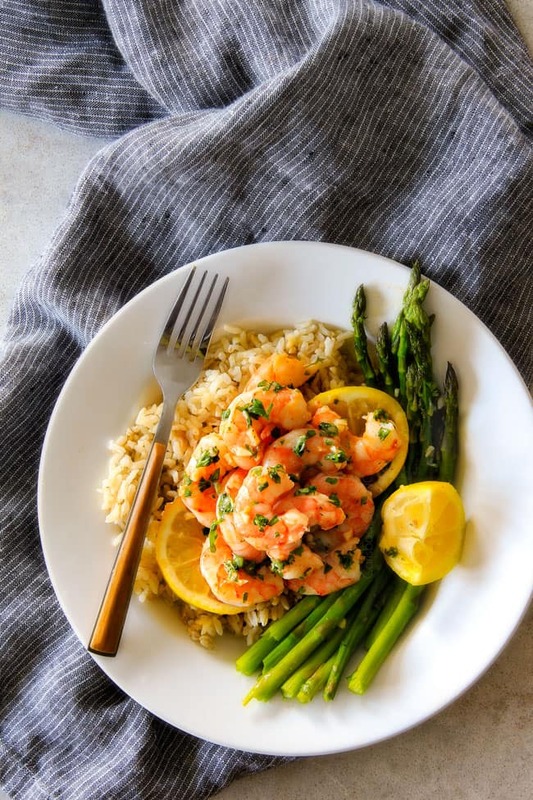 UPDATE: Since posting this Lemon Garlic Butter Shrimp and Asparagus Recipe, it has been my #1 recipes for over a year and a half! 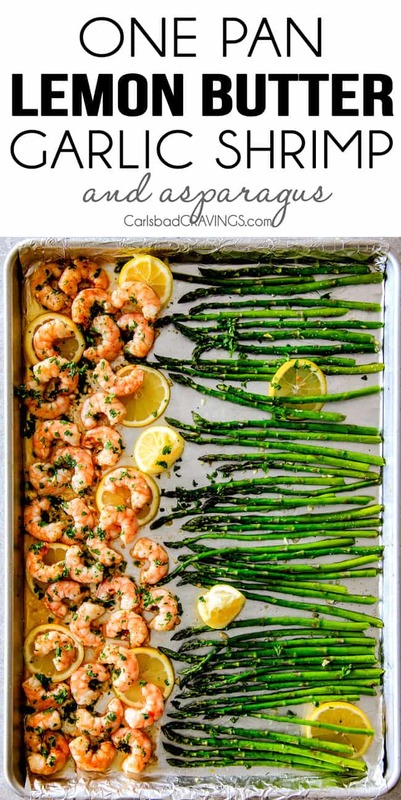 I slightly modified the recipe to make Sheet Pan Shrimp Scampi as well – you don’t want to miss it! The easier way to defrost your shrimp if you remember in advance is to remove your one pound frozen shrimp to a covered bowl and let them defrost in the refrigerator overnight. After your shrimp is defrosted, we are ready to get onto the main event to create a ONE pan meal. Line a jelly roll pan with foil, add your asparagus then toss with olive oil, garlic, salt and pepper. The roasting time will depend on the thickness of your asparagus. I use thin asparagus for this recipe and roast for 4 minutes. If you have medium asparagus, then you’ll want to roast closer to 6 minutes. Next remove the asparagus, push to one side of the pan and add you raw shrimp. 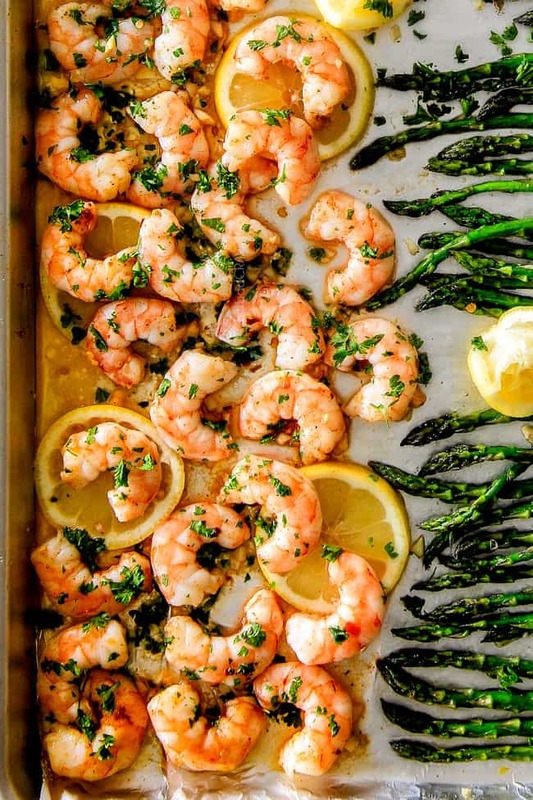 To achieve succulent shrimp perfection, we drizzle our shrimp with olive oil then toss with garlic, salt, pepper, paprika, red chili flakes and fresh parsley, then dollop the shrimp with 2 tablespoons cubed butter and the asparagus with 1 tablespoon butter. 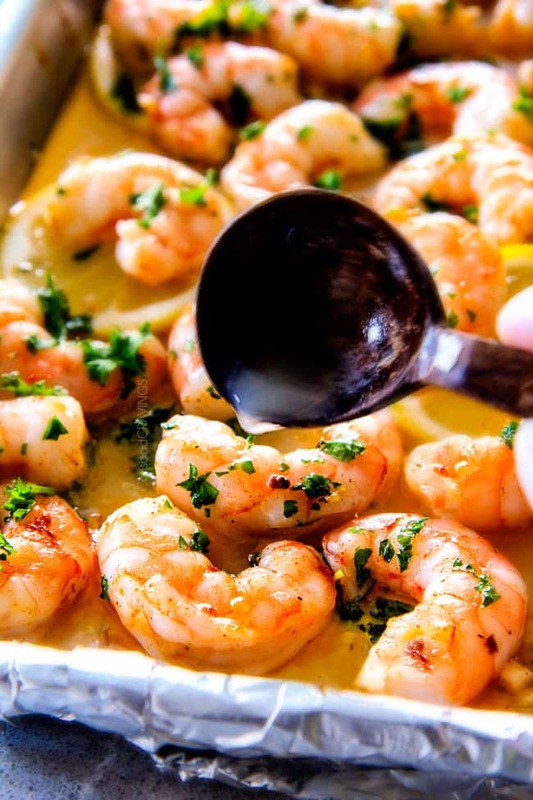 I’ve seen some roasted lemon garlic butter shrimp recipes that use as much as 1 cup (2 sticks!!!) butter so feel free to use more or less butter, but I think the 3 tablespoons is perfect to create buttery shrimp while still feeling good about eating it. 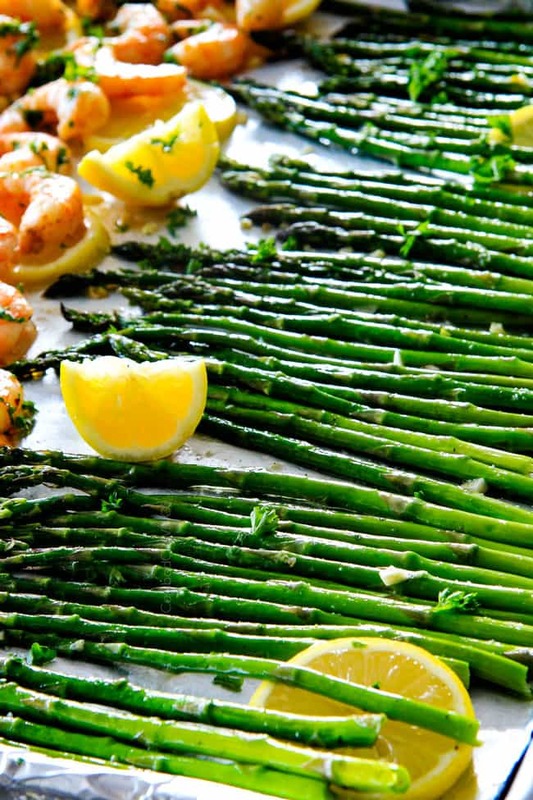 After you roast your shrimp and asparagus for another 6 minutes, you drizzle with fresh, bright lemon juice. 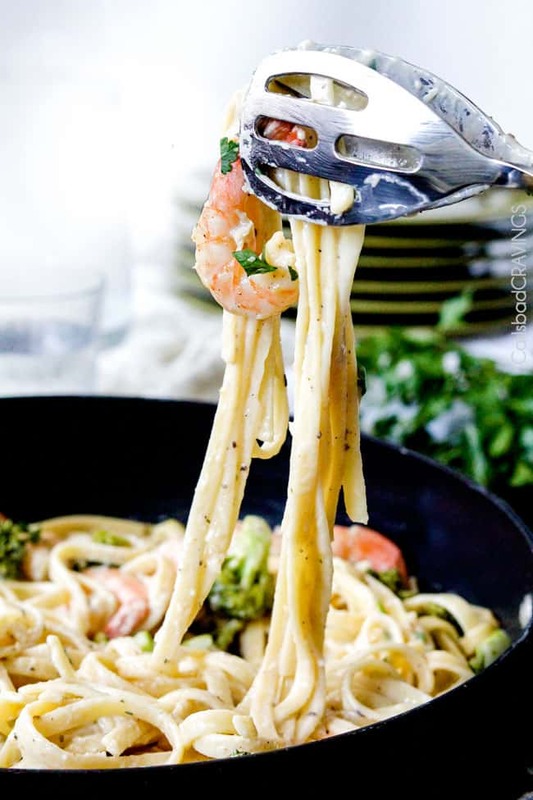 The melted butter mingles beautifully with the lemon juice to create a light lemon butter sauce that you can drizzle over rice or pasta. And there you have One Pan Roasted Lemon Garlic Butter Shrimp and Asparagus with buttery shrimp, garlic shrimp, lemon shrimp, one pan shrimp. My favorite kind of shrimp. 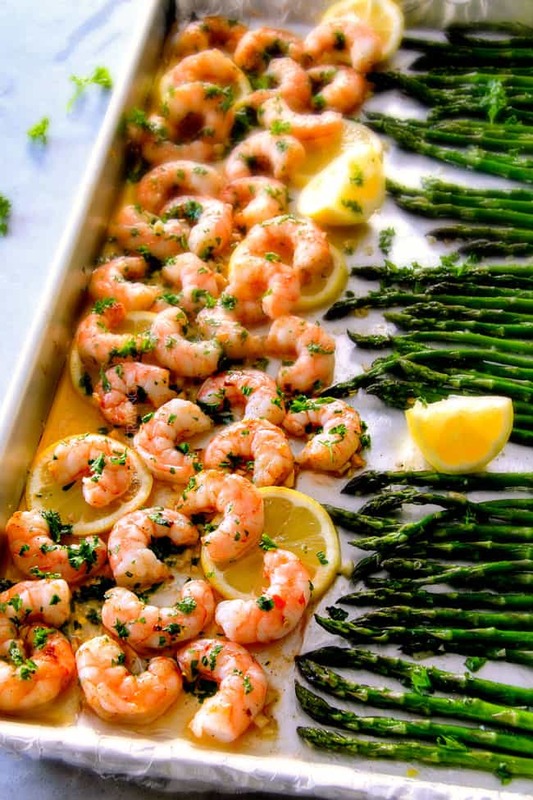 Want to try this One Pan Roasted Lemon Garlic Butter Shrimp and Asparagus Recipe? Pin it to your SEAFOOD, ONE PAN, or DINNER Board to SAVE for later! Line a Jelly Roll Pan (10x15) with foil and lightly spray with cooking spray. Add asparagus and drizzle with 1 tablespoon olive oil. Add 1 minced garlic clove, 1/4 teaspoon salt and 1/8 teaspoon pepper. Toss until evenly coated then line asparagus in a single layer. Roast for 4-6 minutes depending on thickness. I’m so happy to hear that Katie, thank you! Butterflying and stuffing the shrimp sounds out of this world! I just made this for my family and it was AMAZING!! Thank you!! You are so welcome! I’m so happy its a winner! Had this for dinner tonight. It was amazing! Thanks for sharing. You are so welcome! I’m so happy you loved it! Thanks Beth! 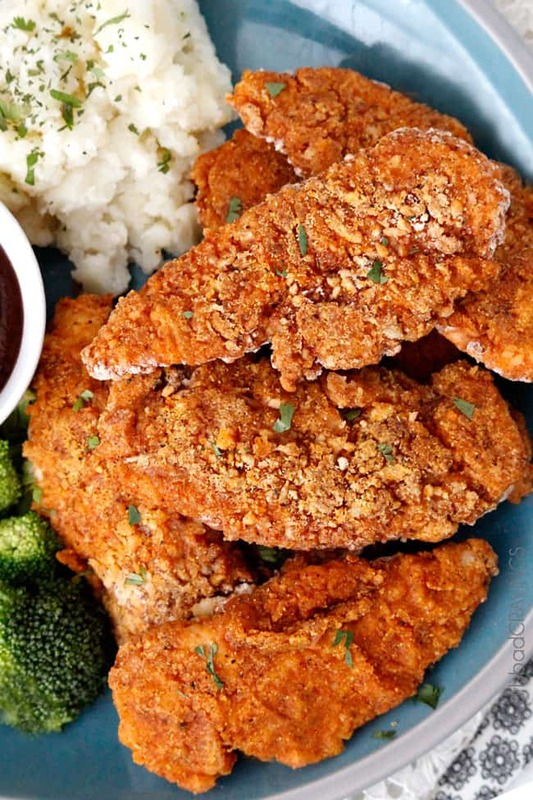 Do you have the nutritionals for this meal? You are so welcome thank you for taking the time to comment! I hope you have fun exploring my site! I left out the paprika, red pepper flakes, and parsley then added parmesan. Both teenage, veggie hating girls loved it. I added extra butter so there would be a sauce to add to noodles. Will surely be making this again! I’m so happy you loved it! Parmesan and more butter sounds delicious! WHat temp isn’t the oven? It’s in Step 1 and can be easy to miss – 400 degrees F. Enjoy!